I LOVE this watch. It is stylish and comfortable. I get quite a few compliments on it, and I would buy it again. Plus, with a coupon/code, you can get a great deal on it, too! Iconic designer Michael Kors is one of the top names in American fashion, with fashion-forward styles and bold designs. This goldtone ion plated steel and brown leather watch from the Runway collection features a wraparound strap and a gold dial. Very nice watch, if you like something different. But the price... there was still the tag attached from the store ( $160)! So you do not safe that much! It's not the same Overstock it used to be! The watch is great. Really nice leather strapped MK watch. I got it for a friend and she loved it! This MK Watch is nice just as my others Mk pieces. I love the extended strap, that doubles up. It’s very unique and different overall the appearance and leather is beautiful. Love this watch, it looks exactly like the picture! It is so unique with the double leather band. It is very sleek looking I like that the face of the watch is simple and not busy. I was concerned about the fit with the double wrapped band but it fits great and looks awesome! Very cool watch. Beautiful watch. Looks exactly as pictured. 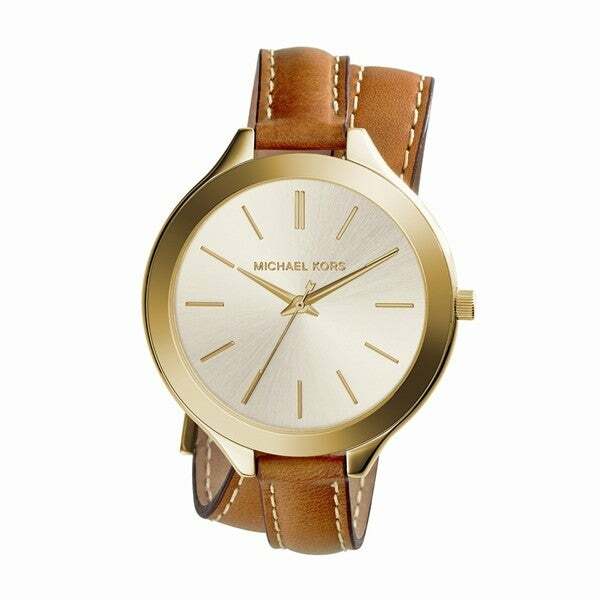 It is a quality piece that you would expect from Michael Kors. Looks great on and perfect for everyday use. The watch is very nice in person. The band has a comfortable feel. The face is simple and classic. The gold tone is soft and classy. The only thing I need to mention is even though you can adjust the band it is not ideal for someone with a thin wrist. My wrist is thin and the face looks really big on my wrist. The band cannot be adjusted to fit my wrist. The band needs another whole and then it might fit well. Love the size and the combination of the leather and gold trim. My wife loves this!! She says she likes that she can wear it with any outfit. She can make it casual or wear it to work. Very nice watch, beautiful look. Simple but smart. What a great deal this double leather watch was, we got this as a thank you gift for our best friend. She uses this watch offten. It can be dress up or down. Just beautiful. This watch matched the description exactly! It is extremely versatile and can be dressed up or down. The band is somewhat small and will not comfortably fit larger wrists. However, the watch face size is perfect! "Is this a genuine Michael Kors watch and could you kindly tell me if this watch comes in the black Michael Kors gift box? Thank you." Hello lizzy, we appreciate your inquiry. Overstock stands behind each of our items and authenticity. We do apologize, we cannot guarantee this item will arrive in a gift box. Thank you for shopping with us. "I bought this watch and I'm extremely disappointed that the strap barely wears around my wrist twice - it barely wraps around the pillow in the box that the watch comes in, squishing it to hook into the last hole on the leather band. Why can't there be strap size options for people who don't have a size 5 wrist?! I'm 5'8" and 135 lbs, so this isn't even a weight issue - which shouldn't be an issue anyway. Designer watches should be available to everyone, no matter what size. Ugh. So disappointed." Hello Lori, you will be contacted by Customer Care. Have a great day. Love the double band color and face if the watch. Gorgeous Watch, can be worn with everything. "Does the watch use a battery or is it self winding. Not describe on website. Also does the leather band wrap twice around the wrist? It appears to in the picture. Dawn"
Hello indigowolf, This watch uses a battery, and the band does wrap around twice. Thanks for shopping with us.